I just spent a few minutes on dayzeroproject. I have four lists: Done, To NOT Do List, (to do) Someday, and to do in 2019. 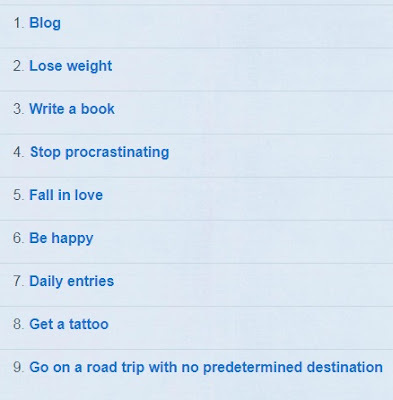 Added most things to 'done', and also I found it fun that there are top popular goals that I do not share at all e.g. Lose Weight, Get a dog. Currently have 30 goals of which 15 are in the done category. I'll get back to playing on the site sometime. Someday I want to, well, die, get married, get divorced, things like that. and yet, none of these is essential or even that exciting. I can't think...I have ideas, just boring stuff like write this, write that, oh and win a nobel prize, that's exciting. and do maths again and teach again but older, and the great thing now is that i've sequenced them so it's not as much of a muddle now what i'm learning/doing. I am happy to report that there are new things I'll like to do this year...I forget what they are, already. I think "go on a cruise" was one. There's also 'Get A Job' and 'Volunteer' - i mean volunteer in the sense of sign up for something physical with people physically doing physical volunteering like feeding people or helping build a home or cleaning up a street - I haven't done that in a while, in years. I could also add it to done... Hmmm, my build a home experience (once or twice) was just moving buckets of sand/rubble at a Habitat For Humanity site in the US (back in the day), but these days I actually want to do something like what bricklayers do or something on a construction site...I find myself interested in the physical work at houses under construction. I also find mechanics fascinating. It's really engineering. I've gone on shorter cruises - back home the same day, not sure what a longer cruise will add to me except that I look forward to the messy crowdedness of it - maybe I miss people, and 'free' food. I imagine it will feel a bit dirty, lots of germs, but that can be nice too. A lot of cruiseline advertising/marketing so I suppose it has got me fascinated. Get a job, because, well, same reason as the cruise idea, something to do even though it's just something to do, for a change, and in the case of the job, to get some change lol. There are some jobs I want, I'm sure. The site is not very good (yet), maybe it's new. I wish I was a master designer and could help make it awesomer. And I wish I had a big fat blog following to help make it popular after it's been made awesomer, lol. Summary: Life is beautiful. Whatever. We need this new 43things. 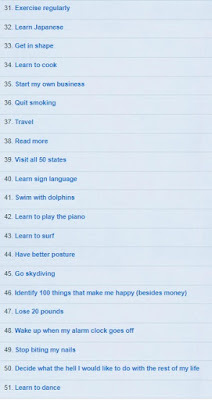 actually, the 2019 goals i had were: Blog, Volunteer, and Go on a cruise. Not 'get a job'. Ok. Lol. Good chance I'll need to 'Get A job' anyway. if it seems like i'm hiding something, uhhh, yeah: i have years of books planned out that i want to write. i want to do another 10 years of that and switch into being a math professor or something like that for at least 10 years. during my 10 years of that (lit) i want to do the love and marriage and kids thing but it's hard to want something if it's running away all the time. one of the kids ran away (before he was even conceived) and i can't really say it's a bad thing, i'm better off without the kid and the kid is better off without me, has a funner and easier life ahead of it that way lol. during my 10 years of that I want to do whatever, including learn math, make money, change the world, all things that I've sort of done before. and during the actual math'ing years I sorta know how that will go because I've done that before too, it's just that now I'll be older, more seasoned at it, better, just as generous or more, and so on. Summary: The World is getting better. Whatever. Do your best. I just thought of something fun: a kiss list. I want to kiss Stephen Colbert. I was thinking on the cheek but ok we could kiss in the mouth if you say so. Why? I like the guy. I watch the show that he presents very regularly - my #1 online video activity - and the show makes me laugh and when it's away for many days I miss it. So, whatever. I want to kiss the guys on my marry list. Hmmm, I could totally make a goal of that. My marry list has 5 people on it, it used to be 4 + a wildcard but I just added one cute-faced boy. Most of them are married but I'm sure they could spare a mmuah or a shag. I want to kiss my father. Cheek. I'm sure I have before, I don't remember. Probably. I love him. I want to kiss my mother. She would not mind at all. Ok this is weird. Hmmm, I could make a habit of jumping about kissing people. Yaaaay! I thought postsecret stopped many years ago. Postsecret.com is still posting secrets.